Amir Khan insists there is no reason why he cannot fight both Manny Pacquiao and Kell Brook within the next 12 months. 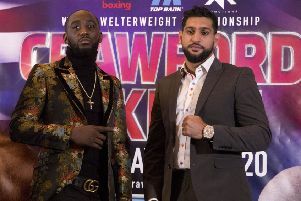 Khan recovered from a second-round knockdown to beat Colombian Samuel Vargas on points at the weekend, and speaking after the fight Eddie Hearn, who promotes both Brook and Khan, suggested a grudge match between the British pair must happen “now or never”. Khan told PA Sport: “I’m 31, I’m still young and there’s still room for both fights. Why isn’t there? I think within a year both fights could be done. “Pacquiao is definitely my priority because he’s globally a bigger name, a superstar in the sport of boxing. To fight someone like him would be amazing. “It’s a tricky fight and people will think I could get beat by him, but I know I can do a number on him. While a stadium fight with Brook appears to be the preference of the British boxing public, Khan believes it could be possible to tempt Pacquiao over to these shores with a good offer. He spent six years working alongside the Filipino under the tutelage of trainer Freddie Roach and believes that insider knowledge would be the key to victory should the two meet in the near future. “In my opinion fighting someone like Manny Pacquiao would be amazing because we were training partners,” Khan added. “I know a lot about him, I’ve sparred with him and I do really well against southpaws. I’ve a 100% record against them so that might be the right fight for me. “We’ve always kept (the relationship) very professional. We’ve known we’ve wanted to fight each other for a long time, there’s always been talk about it but we’ve never talked about each other. “We’ve respected each other’s careers, we’ve respected each other as fighters. It’s not like with Kell Brook and how the talks about that fight have been happening.